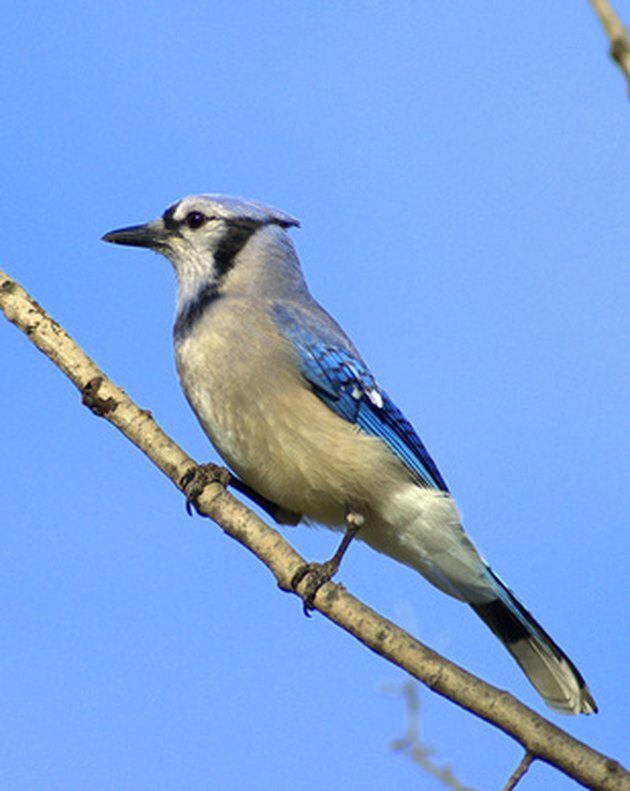 Blue jays are fairly large song birds that sport striking blue feathers. Jays can live in most areas as long as they have a suitable place to nest. Birdhouses must have a perch outside of its entry for the blue jay to land on and fly from, as its wingspan doesn't allow it to fly directly through the entrance hole. Hang the birdhouse at least 5 feet off the ground on a tree, as blue jays prefer nesting in trees rather than in houses mounted on poles. Blue jays often nest in pairs, so a house needs to be big enough for two. Cut a 4 by 8 1/2 inch plank of wood for each side of the house. Measure 1 1/2 inches down from the 4-inch long top of one side piece. Drill a 1 1/2 inch diameter hole to serve as an entrance. Drill a 1/4 inch diameter hole a half-inch beneath the entrance hole. Cut a 4 by 3 1/2 inch piece of wood for the bottom of the house. Cut out a 6 by 5 inch piece for the top of the house. Line the bottom edge of the front piece, which has the hole, with the 4-inch edge of the bottom piece and nail or screw them together. Attach the back piece in the same way. Slide the side pieces into place and nail or screw them to the bottom piece. Nail the sides to the front and back pieces to complete the box. Attach a 1-inch hinge to the center edge of the back of the house, using the screws included with the hinge. Set the top piece on top the house with the 5-inch edge of the top centered over the back of the house. Attach the other end of the hinge to the top piece. The lid opens on the hinge. 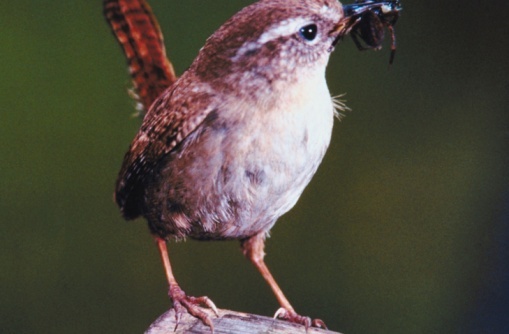 Insert a 4-inch long, ¼ inch diameter wooden dowel into the ¼ inch hole that is beneath the entrance hole to form the perch. Glue the dowel in place with wood glue.